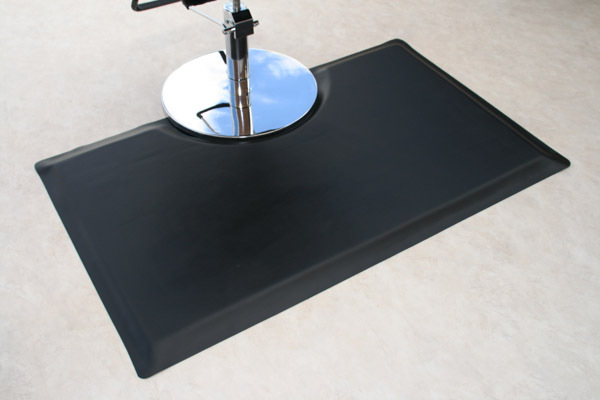 Classic Black Barber Mats offer a comfy rubber top surface and are easy to clean and maintain. These barber mats provide a timeless look while the long-lasting foam base greatly reduces standing fatigue. • The rubber surface puncture- and chemical-resistant. The low-static surface prevents hair from "sticking" to the mats. Made with 25% recycled material. • These barber mats are available 1/2" & 7/8" thick and all have a cut-out (depression) so the salon chair rests evenly on the mat. • Barber Mats available in custom sizes and configurations.